Born about 1786; Died: ____. Married twice. Married Sarah Sparks, daughter of Solomon Sparks and Rachel Weimer. (Info. from Hollar Bible) Solomon Sparks was born on July 13, 1760 in Frederick Co., MD, and came to Bedford County at the age of 16 with two brothers. He enlisted in Boyd's Ranger Company of the Pennsylvania Militia in the spring of 1782 to fight the Indians who were allies of Great Britain during the Revolutionary War. He served for a period of about fifteen months. At the close of the Rev. War, he returned to Frederick Co., MD for about two years before returning to Bedford County. It may have been in Frederick County, MD that he married Rachel Weimer. On April 16, 1794, Solomon received 400 acres of land in Bedford County, probably for his service in the Pennsylvania Militia. He also received 200 acres from the State of Pennsylvania. (His Will states that the 200 acres was located on Owl Creek in Crawford County, PA) With the outbreak of the second war with Great Britain in June 1812, Solomon organized a company of 2nd Regiment of Pennsylvania Riflemen, commanded by Col. William Piper. Included in Sparks' company as a 2nd Corporal was his nephew, James Sparks and the roster of privates included another nephew, Joseph Sparks and his own two sons, Abraham Sparks and Joseph Sparks. The unit saw action in Buffalo, NY. Many years later he applied for a pension for his service. Solomon Sparks was undoubtedly a successful farmer. His home was made of brick which was a bit uncommon in the rural areas of that time. He was also a shrewd businessman and made careful and profitable investments. His daughter, Sarah was born on Dec. 16, 1786 in Bedford Co., PA and died September 13, 1850 in Bedford Co., PA. Buried in the Union Cemetery, Bedford Co., PA. Isaac Latta's second wife, if he did have one, is reported to be unknown. Did Isaac Latta leave his first wife, Sarah, or did he die. Was Sarah perhaps his second wife? 2 WILLIAM (2) b. June 21, 1809. 12 JULIA (2) b. 1822; d. 1880; m. William Manspeaker at Everett, Pa.
"My son, Abraham, is to pay to my five beloved daughters, namely, Sarah, Hannah, Mary, Delilah and Rachel, the sum of $200 each...to my grandson, William Latta, I give $100 to be paid to him when he comes of age." Solomon's will was made January 10, 1821. Solomon Sparks died on April 8, 1838 at the age of 77 years, 8 months, and 25 days. Wife # 1) Miss Margaret Causlett. Lived at Everett, Pa. (Ray's Cove, Route 4). 3 WILLIAM HENRY HARRISON (3) b. Dec. 23, 1840; d. March 21, 1910. 4 JOHN CAUSLETT (3) b. Jan. 18, 1838; d. July 3, 1915. 13 JANE (3) b. abt. 1832; d. 1911; m. Nicholas Garlick. 5 DAVID SAMUEL. (3) b. July 8, 1852; d. Feb. 10, 1937. 6 ABRAHAM (3) b. abt. 1848; d. after 1920. 14 PHILLIP (3) d. young. 15 POLLY (3) d. young. 16 MARY ANN (3) d. young. The 1850 Bedford Co. Census for E. Providence Twp, shows William Latta, age 40, farmer, born in PA, married to Madelina, age 33, born in PA. Their children were: John, 13, school, William, 10, school, Abram, 2, and Philip, 1. The 1880 Bedford Co. Census, shows Magdalene Latta, age 64, widowed, born in PA, living with her daughter and son-in-law, John M. Morgart, age 21, and Rachael A. Morgart, age 26. Living next door was Abraham Morgart, age 48 and wife Sarah, age 44, and three daughters. We would assume that these were the parents of John M. Morgart. Juliann Hughes - 24 *would this be the daughter of Indiana Latta Hughes? 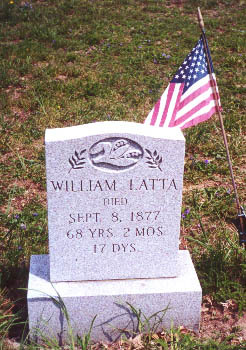 William Latta - 9 *did he take William and Jane to live with him and their grandmother, perhaps after their mother's death. Their father would have remarried. Or was he just living there during school? Jane Latta - 7 *did he take William and Jane to live with him and their grandmother, perhaps after their mother's death. Their father would have remarried. This record shows that William Latta (age 9) and his sister Jane Latta (age 7) were living with their Great-uncle Abraham Sparks, brother to Sarah Sparks Latta, their grandmother. If it is the same William, son of William and Margaret Causlett, above, then he is listed in two households during the 1850 census. Perhaps he was living at the inn owned by Abraham Sparks while he was going to school, so both households included him. The Sparks Family website at www.sparksfamilytree.net states that after the death of his father in 1838, Abraham Sparks headed a household composed of his sisters, Sarah and Rachel, his nephew William Latta and grand-niece Jane Latta. He apparently never married. A considerable portion of the real estate owned by Abraham Sparks was located in Bureau County, Illinois, and this may be the reason why his brother Joseph migrated there. Abraham's heirs were listed as: Hannah Bogges, exec of Jonas Sparks, Philip Hollar, Admin of Hannah Hollar, Delilah Hughes, Julia Manspeaker, heir of Sarah Sparks, Mary Morgert, Rachel Kennard, William States, guardian of heirs of John Sparks, and J. S. Sparks. William (2) Isaac (1). Born at Everett, Bedford Co., Pa. December 23, 1840; d. March 21, 1910 at Wyanet, Manlius, Bureau Co., Ills. ; m. Barbara Ellen Garlick August 25, 1859 in Everett, Bedford Co., PA on November 5, 1839 and died at Wyanet, Ills. June 30, 1920. Both buried at Wyanet, Ills. He served in the Civil War, Private in Co. B, 148th Regt. Vol. Inf. Mustered in August 27, 1863 at Chambersburg, Pa. Promoted Corporal August 1, 1864 and transferred June 1, 1865 to Co. I, 53d Regt., Pa. Vol. Inf., and mustered out with a detachment of that company and honorably discharged June 16, 1865 near Alexandria, Va.
18 SARAH CATHARINE (4) b. September 17, 1861 near Everett, Pa.; d. December 12, 1862 in Bedford Co., Pa. Buried at Everett, Pa. at Providence Baptist Cemetery on Bunker Hill Rd., east of Everett (Rt. 30). Ills. Buried at Manlius, Ills. ; m. James H. King July 6, 1879 in Ohio, Bureau Co., IL. He was born February 28, 1859 at Everett, Pa.; d. May 26, 1927. Thirteen children. East Grove Tp., Lee Co., Ills. Buried at Wyanet, Ills. Married Ida M. Smith February 7, 1899. Twin with Ellen. 1920 Census - East Grove Township, Lee County, Illinois lists John Latta, age 50, farmer, and wife, Ida Latta, age 47. John is also listed in the 1921 Plat Book for owning property at East Grove, Lee Co., IL with his brothers, William B. Latta and George D. Latta. at Everett, Pa. Twin with John. Bureau Co., Ills. Buried at Wyanet, Ills. 30, 1889 in Bureau Co., Ills. He was born June 27, 1868 in Bureau Co., Ills. Ida May died in 1964. Seven children. 1916. He was born February 22, 1869. 7 WILLIAM BARTLEY (4) b. July 5, 1876. 8 GEORGE DANIEL (4) b. Nov. 3, 1878. Wife # 1) Caroline E. Day at Wyanet, Illinois. She died in 1892. Wife # 2) Mrs. Carrie Thompson in 1894 at Pierre, S. Dak. She died in 1899. Wife # 3) Mrs. Anna Davis in June 1905. He was buried at Harrold, S. Dak. He enlisted in the Civil War in Bureau Co., Ills. September 21, 1861 in 57th Ills. Regt. Discharged March 30, 1863 and commissioned 1st Lieut. in 1st Alabama Cav. Later promoted Captain and served until the end of the war. Mustered out at Huntsville, Ala. October 20, 1865. Went to Wyanet, Ills. In 1882 went with his family to Huron, S. Dak. In 1909 to Waverly, Iowa. When he died he was placed beside his mother and children who had gone before. 29 ALBERT G. (4) b. at Wyanet, Ills. May 21, 1868; lived at Eldorado Springs, Mo. 1920 Census, for Box, Cedar County, IL lists Albert G. Latta, age 51, single. Employment not listed. Evidently Albert never married. 30 FRANK LEE (4) b.1871. Lived at Cincinnatus, N.Y. Route 1. 31 NETTIE M. (4) m. Joseph C. Higgins. Lived at Blunt, S. Dak. 32 JOHN W. (4) b. June 20, 1876; d. 1914; m. Edith Smith. 34 CARRIE E. (4) b. at Wyanet, Ills. ; m. Lewis E. Golding. In 1935 lived at Morrison, Ills. 35 DAISY MAY (4) b. at What Cheer, Iowa January 11, 1883; m. E. Clyde Moore. 9, 1937. Married Eva Ellen Coughenour February 13, 1881. She was born in Bedford Co., Pa.
January 24, 1861 and died February 9, 1937. Lived at Ray's Cove, Everett, Pa. Route 4. http://www.mindspring.com/~kopff2/dk/ft/Coughenour/I_C_dec.htm Eva and David evidently divorced, because in the 1920 Census, Eva Latta is listed as living in Brothers Valley, Somerset County, PA, age 59, with two of her sons, Lester L., age 19, and Elmer, age 16. Lester's employment is listed as "civil engineer corps" and Elmer's employment is listed as "miner - coal mines." David is listed in the 1920 Census as living with his brother, Abraham in East Providence, Bedford County, PA, as "D", which evidently stands for "divorced." m. William Harrison Queer July 11, 1899. Children were John, Harvey, Myrtle, E. Elmer, Eddie, Floyd, Merle and Carrie. October 27, 1884. Lived at Cumberland, Md. Children were Elizabeth, William and Merle. 39 DELILAH MYRTLE (4) b. September 24, 1886; m. George Millhouse. Children were Nellie, Luther, Leora and Evelyn. 10, 1907. Lived at Berlin, Pa. Children were Ralph, Samuel, Robert and Harry. Wesley on October 20, 1908. Lived at Somerset, Pa. Children were Sue Ellen, Wilson, and Jenny Elizabeth. 42 HOWARD WILSON (4) b. at Connellsville, Pa. May 31, 1893; m. Anna Moffett. and Harry Miller. Lived at Cumberland, Md. One child: Harry. 9 HARVEY JAMES (4) b. in Somerset Co., Pa. August 8, 1898; m. Pearl Coffman. McCleary. Children were Merle "Buster" and Betty. 6, 1925. Children were Eugene and Jimmy. 44 BERT (4) half brother of the above. Lives at Everett, Pa.
D.S. Latta, 28, single, living in Bard, Bedford Co, PA in the household of James H. Woy. Occupation: Laborer. 45 JOHN (4) b. between 1872; lived in W. Va.
46 JAMES B. (4) b. abt. 1876; m. Ida Mills. Lived at Everett, Pa.
47 MARY M. (4) b. Jan. 9, 1874, died Oct. 19, 1925; single. 48 WILLIAM (4) b. abt. 1878; m. Bessie Hinish. Lived at Everett, Pa. Route 2. 49 HENRY or PERRY (4) b. abt. 1881; m. Blanche Feight. Lived at Everett, Pa.
50 ALBERT ROSS (4) b. July 8, 1888, died July 20, 1914. William H.H. (3) William (2) Isaac (1). Born in Bedford Co, Pa. July 5, 1876; m. twice. 1) Estella M. Kolp January 3, 1900. She was born June 4, 1878 at Messena, Cass Co., Iowa. Died in West Bureau Tp., Bureau Co., Ills. 2) Amy Darlene Miller at Madison, Wis. August 22, 1903. She was born in Bureau Tp., Ills. March 20, 1887. In 1934 lived Ohio, Ills. In the 1920 Census, William was listed as living in East Grove, Lee County, Illinois, age 43, born in PA, farmer, along with his wife, Amy, age 32, born in IL; daughter Stella, age 14, born in IL; daughter Amy V., age 12, born in IL; daughter Eva, age 10, born in ND; son William, age 8, born in ND; son Harry, age 6, born in IL; daughter, Margaret, age 4 years, 7 months, born in IL; daughter Gladys, age 3 years, 1 month, born in IL; and daughter Hazel, age 6 months, born in IL. b. at Red Oak, Bureau Co., Ills. July 23, 1894. 51 AMY VIOLET (5) b. in Bureau Co., Ills. January 25, 1907; m. Edgar C. Rogers b.
at Nashville, Tenn. March 31, 1902. 52 EVA DARLENE (5) b. at Stirum, N. Dak. April 22, 1909; d. November 7, 1928. 53 WILLIAM IRVIN (5) b. at Stirum, N. Dak. March 23, 1911; d. August, 1976 in Harmen, IL (SS. Index); m. Martha Ann Heath May 6, 1930. She was born December 12, 1912. 54 HARRY LESLIE (5) b. January 13, 1913; d. Dec. 15, 1998 in Sterling, IL (SS. Index). Morgan at Sycamore, Ills. July 29, 1933. He was born at Stirling, Ills. May 11, 1912. 56 GLADYS IRENE (5) b. at Sheffield, Ills. December 5, 1916. 57 HAZEL GERTRUDE (5) b. at Amoy, Ills. July 1, 1919. 58 BLANCHE HELEN 95) b. at Amoy, Ills. November 14, 1921. 60 KENNETH LOUIS (5) b. at Amoy, Ills. January 8, 1926. 61 DONALD WAYNE (5) b. at Amoy, Ills. July 16, 1929; d. Nov. 24, 1996 in Amboy, IL (SS. Index). Co., Ills. September 13, 1886. http://homepages.rootsweb/~smoore/58.htm - says that George married Nelle L. Vaughn in 1906 in Bureau Co., IL. She was born Sept, 1885 and died Oct. 14, 1960 in Princeton, IL.) General mdse. at Bradford and was in partnership at Princeton, Ills. with his son, Vaughn, breeding and marketing saddle horses. In 1934 lived at 902 West Putnam Street, Princeton, Ills. George is listed in the 1920 Census as living in East Grove, Lee County, IL, age 34, born in IL, farmer; wife Nellie, age 33, born in IL; daughter Dorris, age 13, born in IL; son Vaughn, age 11, born in IL; and daughter Inez, age 8, born in IL. 7, 1925. He was born March 1, 1905. One child: Betty Jane b. April 24, 1927 at Princeton, Ills. 63 VAUGHN BURDETTE (5) b. at West Bureau, Ills. November 10, 1908; d. May, 1967 (SS. Index). 64 INEZ ILENE (5) b. near Ohio, Lee Co., Ills. November 16, 1912. Egbert. See my Scrap Book for particulars. The Grand Jury refused to indict. 65 EVA ELLEN (5) b. May 8, 1918 at Dunbar, Pa.; d. September 28, 1937. 67 LLOYD JACKSON (5) b. November 4, 1920 at Dunbar, Pa.; died. 68 SAMUEL DAVID (5) b. February 16, 1922 at Dunbar, Pa.; died. 70 ELIZABETH JANE (5) b. July 30, 1924 at Berlin, Pa.
71 MERLE LEROY (5) b. November 3, 1926 at Akron, Ohio, 725 Chitty Ave.
72 ELMER EUGENE (5) b. at Berlin, Pa. February 16, 1925. 73 JAMES LeROY (5) b. at Somerset, Pa. October 11, 1930. Abraham (3) William (2) Issac (1) James B. Latta was born about 1879 in Pennsylvania; married Jessie ______. Lived in Westmoreland Co., PA. In the 1920 Census, James B. Latta was listed as living in Hempfield, Westmoreland County, PA. He was 40 years old, born in PA, and a laborer in the railroad car shop. Living with him was his wife Jessie U., age 39, born in PA; daughter Effie, age 17, born in PA; daughter Gladys L., age 14, born in PA; daughter Helen A., age 12, born in PA; son Ethmer A., age 9, born in PA; son Eugene W., age 7, born in PA; and daughter Doris J., age 1 year, 6 months, born in PA.
76 EFFIE (5) b. 1903 in Westmoreland Co., PA.
77 GLADYS L. (5) b. 1905 in Westmoreland Co., PA.
78 HELEN A. (5) b. 1908 in Westmoreland Co., PA.
84 ETHMER A. (5) b. 1911. 85 EUGENE W. (5) b. 1913. 86 DORIS J. (5) b. 1918. Elmer Wesley (4) David S. (3) William (2) Isaac (1). Born at Berlin, Pennsylvania on February 16, 1925. Married Josephine Darbic. 81 ALICIA (6) m. John Soliz. mother was a sister to Barbara E. Garlick, wife of 3 William H. H. Latta.